Thanks to one of the lovely authors at Crimson Romance for sharing this bizarre but brilliant resource. Have you ever struggled with writing a period story and wondering whether the language you're using is appropriate? Struggle no longer! For any word you care to enter, this website will tell you how many times Jane Austen used the word, and which related words she used, or did not use. It's probably more of a game than a serious resource since it doesn't differentiate between different meanings of the same word (just try entering 'flowers' or 'red' and you'll see what I mean) but it's enormous fun and could certainly help steer a historical author in the right direction. 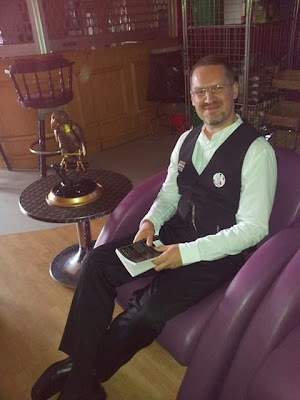 Sorry this photo's a little fuzzy, but I grabbed it on a whim at Steampunk Doncaster as Jonathan Green was about to start reading from his latest Pax Britannia novel, Time's Arrow. The novel, featuring dapper daredevil Ulysses Quicksilver (a James Bond-meets-Oscar Wilde kind of hero) sounds like an absolute delight, but it may take me a while to get to it, partly because of my already huge TBR pile, but mostly because it's number 8 in a series I know I'm going to want to savour! Jonathan was a great speaker, as was Meg Kingston, whose novel Chrystal Heart is now gracing my Kindle (if you're in the UK, grab it quickly at a bargain £2.99 as it will be back up to full price soon). The heroine is a 188-year-old cyborg vampire, the cover features a hat almost as delicious as Meg's own, and I can't wait to crack the virtual spine on this one. Today I'm delighted to welcome Sarah Grimm, author of 'After Midnight' and 'Not Without Risk'. Hi Sarah! I'm looking forward to hearing more about you and your books. ‘After Midnight’ is a contemporary romance with a musical theme. Are you musical? Growing up our house was constantly filled with music. Whether it was The King and I or Anne Murray, Styx or Simon & Garfunkel, there was always music playing. We are a music loving family.And on those rare occasions when the stereo wasn’t going, one of us was usually practicing for an upcoming band or orchestra performance. Me, I played the bass (string and electric). I was good at it, first chair. But what I always wanted to be good at—hell, great at—was playing the piano. I adore the piano, and it is that love that I put into AFTER MIDNIGHT. Can you tell us about the inspiration behind the story? By the way, I'm now booking Wednesday interviews for the rest of June and July, so if you're a published author and feeling chatty, please get in touch via my comments page, or facebook or twitter. Don't forget to include an email address so I can send you questions (and preferably a link to your blog, website or books on Amazon, so I have some idea what to ask!). I've never quite got to grips with twitter hashtags, but there are two I follow regularly: #amwriting and #amreading. The third of the literary set, which I'm now finding more reason to pay attention to, is #amediting, which is used to post updates and tips on the editing process. The reason I'm paying attention to this tag (and the reason you may find my blog unnaturally quiet for the next week or two) is that I'm deeply embroiled in round two of edits for 'The Santa Next Door.' If I get the time, I'll update my progress on twitter... using, of course, the hashtag #amediting!